New York: Simon and Schuster, 1977. The creation of the Panama Canal 1870-1914. A Touchstone Book. Special Limited Edition, bound in hand-crafted leather by Brown & Bigalow is #178 of 400 issued. Card to that effect attached ffep to commemorate (I presume) the Transcanal sailing of the Royal Viking Sun dated November 27, 1991. Closed 3/8" chip top rear board, 3" X 1 1/4" pieces torn from top of 2 adjoining ep's (fon?). Tan, padded leather boards feature author/title, blindstamped on front above gilt stylized bird; spine has gilt text and decorations. Very slight scuffing to corners, speckled edges all around. 615 pp. plus: Afterword, Acknowledgments, Notes, Sources, Index. 698 pp. total. Illustrated with b/w photographs/editorial cartoons. Book weighs 2 1/2 lb. and will require extra shipping costs. Digital pictures available on request. Bookseller's Inventory # 091126.. First Edition First Printing. Leather. Fine/No Jacket as Issued. 9 1/4" X 6 1/4". Simon and Schuster, 1977 Very good first edition, first printing in a very good dust jacket, with some wear on the bottom of the jacket near the spine and some tape inside the jacket not visible on the outside, with a bookplate signed by McCullough laid in. Complete row of numbers from ten to one on the copyright page, and original price of $14.95 on the front flap of the dust jacket.. Signed by Author(s). 1st Edition. Hardcover. Very Good/Very Good. Simon & Schuster. Inscribed " This first edition is for Bette and John with warm regards David Mccullough Hillsdale College 2006" on the title page. The dust jacket has wear to the edges and light soiling . Near Fine. Hardcover. 1st Edition. 1977. 1977-01-07. New. Ships with Tracking Number! INTERNATIONAL WORLDWIDE Shipping available. Buy with confidence, excellent customer service! New York: Simon & Schuster, 1977. Book. VG+. Hardcover. Signed by Author(s). First Edition. First printing. A VG+ copy in a VG+ dust jacket with the price of $14.95 intact on the front flap. Signed by the author on the half-title page. Winner of the 1978 National Book award..
New York: Simon and Schuster, 1977. 698pp.incl.index; HB blue w/silver; slight rub w/clean,tight pgs. DJ white w/blk.&blue-pic.cover; some rub; chip,tp.spine. Fact-filled account of an unprecedented engineering feat. 2 detailed maps & more than 80 photos. signed?. 1st. Hard Cover. Near Fine/Very Good. 8vo - over 7¾" - 9¾" tall. New York: SIMON AND SCHUSTER, 1977. Book. N-Fine. Hardcover. First Edition/First Printing. A square tight solid copy that if it was rtead it was read carefully. This copy has some minor soil to the edges of the text block. The 14.95 jacket has some light soil else fine. Chronicles the erection of the Panama Canal. A very nice copy of the elusive first printing. THIS COPY IS IN MY POSSESSION AND NORMALLY SHIPS NEXT DAY. A nice copy..
2003-01-07. New. Ships with Tracking Number! INTERNATIONAL WORLDWIDE Shipping available. Buy with confidence, excellent customer service! 2004-05-02. New. Ships with Tracking Number! INTERNATIONAL WORLDWIDE Shipping available. Buy with confidence, excellent customer service! 1978-01-05. New. Ships with Tracking Number! INTERNATIONAL WORLDWIDE Shipping available. Buy with confidence, excellent customer service! Riverside, New Jersey, U.S.A.: Simon & Schuster. Very Good. 1978. Soft Cover. 8vo - over 7¾" - 9¾" tall 0671244094 Signed by Author Large softcover. Limited edition commissioned by the Royal Cruise Line in honor of the anniversary of the beginning of the American consruction of the Panama Canal. Signed by author. One small tear on cover which has been repaired with tape otherwise very good cond . The Path Between The Seas: The Creation Of The Panama Canal 1870 - 1914. Simon and Shuster, New York., 1977. First Edition (Shown But Not Stated).. Hardcover.. 9 3/8 H x 6 1/4 W x 1 3/4 thick.. NON SMOKING STORE. My listing INCLUDES PHOTO OF ACTUAL BOOK for sale. Book Interior FINE / Boards Fine / Dust Jacket Near Fine. Book feels Never read or very gently read once. Sewn binding. Rag edge pages. Spine is straight, square, solid, has a miniscule bit of edge wear on bottom of spine, none on top, has short horizontal crease at top free end and a few short vertical creases on bottom free end of spine. Dust jacket is white, lettering black/blue, cover painting and design 1977 by Wendell Minor, black/white photo on back. Dust jacket is NOT PRICE CLIPPED, has a bit of age darkening on edges and folds of flaps and on some of the white spine and back, small amount of shelf wear and soil on back, some small creases and edge wear on top and bottom of dj spine and a 3/8 inch rip, one short crease on front of dj at left upper corner, minor edge wear. Book boards and spine are flat, clean, bright, no rips, no bent corners, no spine creases, no sunning, very small amount of edge wear. Page edges very slightly sunned. Inner end papers are tan. Pages are sagging very slightly while book was upright for so long. Inside of book is tight, clean, bright, clear, flat. No dog ears that I saw. OwnerÕs name, date, small, in ink on ffep. Two detailed maps and more than 80 photographs. Preface. Acknowledgements. Notes. Sources. Index. Edition: First Edition (Shown But Not Stated). Simon & Schuster. Hardcover. 0671225634 Simon and Schuster; New York, 1977. Hardcover. Book club Edition. Signed and inscribed by author directly on front free endpaper. Near Fine, blue cloth binding with minimal signs of shelf wear, in a Very Good, some wear/scuff marks, some edge/corner wear, small tears to spine edges which are clear taped, wrap edges clear taped, sticker residue to rear panel, Dust wrapper. A nice, clean unmarked copy. 8vo[octavo or approx. 6 x 9 inches], 697pp., indexed, some b&w illustrations. We pack securely and ship daily with delivery confirmation on every book. Please Note: Depending on site, actual book for sale may differ physically from picture listed. Additional Scan(s) are available for any item, please inquire. . Very Good. Simon &amp; Schuster Audio, 2003. CD-Audio. New. 5.87 x 0 cm. Simon &amp; Schuster, 2004. Hardcover. New. 9.25 x 6.25 cm. Easton Press, 1990. Hardcover. Very Good/No Dust Jacket. Hardcover 2 volume set. Easton Press Library of American History. Very nice grey leather boards with decorations in gold on front and rear boards.Spines slightly sunned. Title in gold on spine between raised bands. Gilt edges. Text pages are crisp and clean. Notes From History page laid in. Always carefully wrapped and shipped in cardboard boxes to protect your purchase. 2003-01-07. Good. Ships with Tracking Number! INTERNATIONAL WORLDWIDE Shipping available. May not contain Access Codes or Supplements. May be ex-library. Shipping & Handling by region. Buy with confidence, excellent customer service! Simon & Schuster, 1977-06-15. Hardcover. Used:Good. History Book Club, 2002-01-01. Hardcover. Used:Good. Simon & Schuster. Hardcover. 0743262131 New Condition. . New. Simon and Schuster/ Fireside Book, 1977. Book. N-Fine. Hardcover. Book Club Edition. A solid tight very carefully read copy. This copy has light browning to the edges of the text block. The jacket has some light rubbing, light soil, lightish edgewear, a short closed tear. This is the full size hardback, identical to the True First, full dark blue cloth boards. A nice hardback copy of a hard to find book. THIS COPY IS IN MY POSSESSION AND NORMALLY SHIPS NEXT DAY..
Simon and Schuster, 1977. Book. N-Fine. Hardcover. Book Club (BCE/BOMC). A solid tight clean un-read copy. This copy has light pagedge soil else fine. The jacket has some light rubbing, light soil, minor wear at edges and folds. This is the full size hardback, identical to the True First, full dark blue cloth boards. A nice hardback copy of a hard to find book. THIS COPY IS IN MY POSSESSION AND NORMALLY SHIPS NEXT DAY..
New York: Touchstone Books, 1977. Book. Very Good +. Trade Paperback. Later Printing. A square solid tight carefully read copy. This copy has some light pagedge soil, two light corner bumps, some light browning to extremities. This copy was one of a group that were presented to the passengers of the of the Royal Odyssey, a cruise liner that is/was a part of the Royal Cruise line in 1984, as a souviner of a cruise through the Panama Canal to celebrate the 70th anniversary of it's completion in 1914. This copy has two items laid in that verify the above, a copy of a note from the from the administrator of the canal and also a bookmark from the Cruise Line, both items mentioning the celebration. In addition there is a tipped in page containing a note from David McCullough with his facsimile signature. This copy is one of an un-known number of a Limited Edition, publisher's phrase not mine, limited by the presence of the tipped in page with the McCullough signature. A book by the Pulitzer Prize winning author of John Adams and Truman THAT ACTUALLY MADE A TRIP THROUGH THE CANAL. THIS COPY IS IN MY POSSESSION AND NORMALLY SHIPS NEXT DAY..
Simon & Schuster. Hardcover. 0743262131 Special order direct from the distributor . New. 1977-01-07. Good. Ships with Tracking Number! INTERNATIONAL WORLDWIDE Shipping available. May not contain Access Codes or Supplements. May be ex-library. Shipping & Handling by region. Buy with confidence, excellent customer service! New York: Touchstone Books, 1977. Book. Very Good +. Trade Paperback. First Edition/First Printing. A tight solid copy with with some pagedge soil, some rubbing wear, light cover soil. The edges of both pictorial covers have been re-inforced with clear tape by a previous owner. Great reference work and also a nice piece for your collection. This is the first softcover edition of this title. THIS COPY IS IN MY POSSESSION AND NORMALLY SHIPS NEXT DAY..
1978-01-05. Good. Ships with Tracking Number! INTERNATIONAL WORLDWIDE Shipping available. May not contain Access Codes or Supplements. May be ex-library. Shipping & Handling by region. Buy with confidence, excellent customer service! New York: Simon & Schuster, 1977. Book Club edition. 8vo. 697 p. Index. Sources. Notes. Black and white photographs. 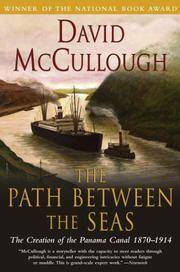 McCullough's readable and comprehensive history of the building of the Panama Canal. Gift inscriptions on ffep. Near fine in near fine jacket in mylar cover.. Book Club (BCE/BOMC). Cloth. Near Fine/Near Fine. 8vo - over 7¾" - 9¾" tall. Simon & Schuster. Hardcover. 0743262131 Like New Condition. . Fine. Simon & Schuster. Hardcover. 0743262131 . New. New York: Touchstone Books, 1977. Book. Near Fine. Trade Paperback. First Edition/First Printing. A square solid tight carefully read copy. This copy has some light rubbing wear, light pagedge browning, minor cover edgewear. A book by the Pulitzer Prize winning author of John Adams and Truman. The first paperback edition of this titles. THIS COPY IS IN MY POSSESSION AND NORMALLY SHIPS NEXT DAY. Nice copy..
Simon & Schuster. Hardcover. 0743262131 signs of little wear on the cover. . Very Good. History Book Club, 2002. Foreword by Peter Winn. Large, heavy, sturdy book, blue spine, black boards, very bright gilt lettering on spine, address label and flag decal on first front end paper, 698 pages including four glossy photo sections. DJ beneath mylar, glossy and colorfully designed on front, photo of ship in lock at center front, praise on back. DJ has very slight wear at spine top edge. Near Fine DJ/Very Fine book. . Hard Cover. Fine/Near Fine. New York: Simon and Schuster, 1977. First Printing. Hard Cover. Very Good dust jacket. Octavo. 698 pp. A fresh, clean copy in a lightly shelfworn dust jacket; the book presents well; price intact on the front flap of the dust jacket. New York: Simon and Schuster, 1977. 698p., b/w illus., dj. Simon & Schuster. Hardcover. 0743262131 BRAND NEW, GIFT QUALITY! NOT OVERSTOCKS OR MARKED UP REMAINDERS! DIRECT FROM THE PUBLISHER!|2.55 . New. New York: Touchstone Books, 1977. Book. Very Good +. Trade Paperback. First Edition/First Printing. A tight solid copy with some pagedge soil, some rubbing wear, light cover soil, creasing to both covers. Great reference work and also a nice piece for your collection. This is the first softcover edition of this title. THIS COPY IS IN MY POSSESSION AND NORMALLY SHIPS NEXT DAY..